When you reach for your dreams, whether it’s having your own business, buying a home, losing weight, leaving a relationship, or any effort to create a better life, you can count on hitting a wall. It’s almost as if life wants to test the level of your commitment. It wants to know if you really want what you say you do. In extreme cases, the chaos feels like life wants to destroy every chance you have of ever succeeding at anything. Take heart, having some or all areas of your life come undone just when you decide to reach for your dreams is common; it’s to be expected. There’s no sense in fighting it. Before all great creations manifest there’s chaos. Chaos is life’s birthing mechanism. It’s not fun, but you can handle it, if you’re ready. The tragedy is that most people see the chaos as a message of failure and a reason to retreat. They give up. 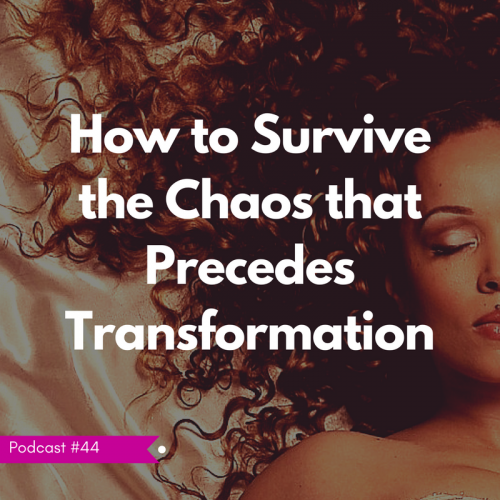 In this episode, I’ll share my own struggle with the chaos that preceded one of my life’s greatest transformations, and I’ll share several other examples of people who persevered and won. When you expect chaos and challenges to be a real part of your success journey, you’ll know how to handle it when it happens. You’ll be ready to dig in and persevere, and ultimately, you’ll reach your goals. Tune in and prepare yourself to succeed!